Ireland’s history is full of magical creatures, legends of great kings and tales that still inspire people today. Some people on this planet know what it means to enter this different world—a magical world and a world of the past—a world that wants to be explored. But when we get older, many of us lose the ability to enter this world. I was very close to losing it — A year before I started to study at Trinity I decided to do “the responsible thing” and study Law. looking back, it would have been a choice that I would consider a mistake. I have always been one of those people who loved to read, hear about fallen civilizations and find out about historic battles and magic swords. I knew it was time to study something that I actually cared about, so I made the decision to come to Trinity College Dublin. It is a wonderful university, in a country surrounded by legends and I get to study what has fascinated me for so long; History. Three months after I arrived, I knew I had made the right decision for many reasons. A lot of people think they know about Irish history or its landscape from series like Vikings or Game of Thrones. However, a lot of people don’t know the real history behind these stories — even though it’s very much worth taking a closer look. Ireland has this ability to make history come alive, and Trinity especially! The campus is right in the centre of the city with a number of prestigious museums less than a 10-minute walk away as well as having buildings, churches and cathedrals spanning different centuries nearby. As you learn about the revolutionary, shocking and mythical aspects of history, a lot of what you learn is right there, within reach of the college. 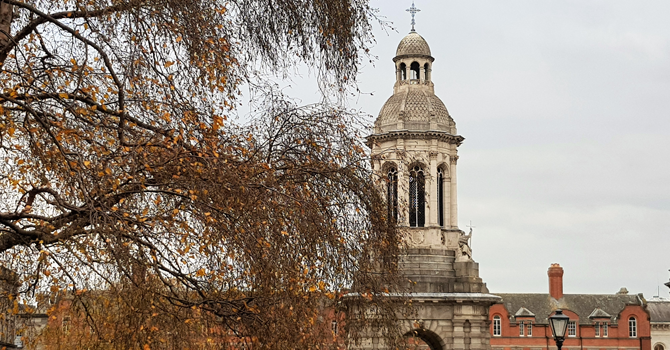 When entering the campus, you see an almost magical phenomenon, when the noise of the busy streets of Dublin fades away and leaves you amidst buildings that capture the history and tradition of TCD so perfectly. A secret tunnel leads to a little room filled with old books — if you can get your hands on an invisibility cloak, you will have the whole Hogwarts experience. The history department is surely one of the most dedicated ones, represented by professors who hold passionate lectures, teaching assistants who offer their support and a staff and student body who regularly organise events. This year, there was even a History Convention. Founded over 500 years ago, the university has been a part of history itself. A highlight of the campus are the stunning buildings, with halls that have been walked by people like Jonathan Swift, Oscar Wilde and Bram Stoker, which brings us back to the world of legends, tales and myths. And finally—because TCD can’t be discussed without mentioning it)— you can easily visit the Book of Kells. 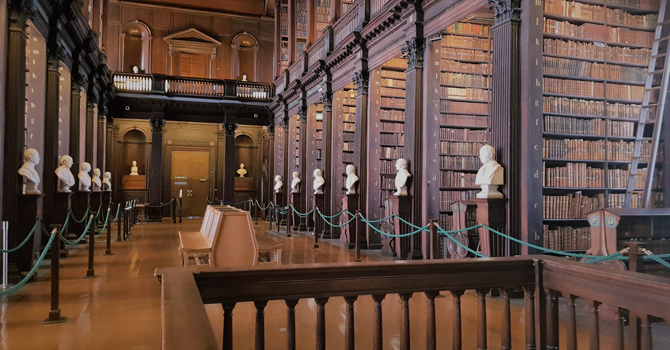 With a look of the book, you also get to see one of most beautiful libraries in the world and several other historical artefacts that will make you wish you had a few hours alone with all of it. Over a thousand tourists visit it every day but as a Trinity student you get the amazing experience of skipping the line which tends to wrap all around the court, and enter for free. There is something special about this college, its staff and students. It is an open and curious mindset that defines Trinity as an institution. Something that amazed me and that I never experienced until I came here was the chance to hang out with like-minded people, have a different and exciting event happening every day as well as societies dedicated to pretty much anything you can think of. This article was originally supposed to be a video showing you the wonderful campus and places where history is just within reach, but some things simply deserve to be written and to be read — especially an article that praises History, a course which ultimately requires quite a lot of reading. Yet neither myself nor any of the other history students I know are complaining. Everyone is comfortable with their choice. The academic standards are high and challenging but becoming part of this wonderful institution and its history is motivation enough to really give it your best. As someone who has chosen an original academic path that did not suit me, I can now tell you that as clichéd as it may sound, it is always the right choice to follow your heart. I do not know what is to come but Ireland will always be a country full of magic and mystery and a history that is still alive in so many ways. 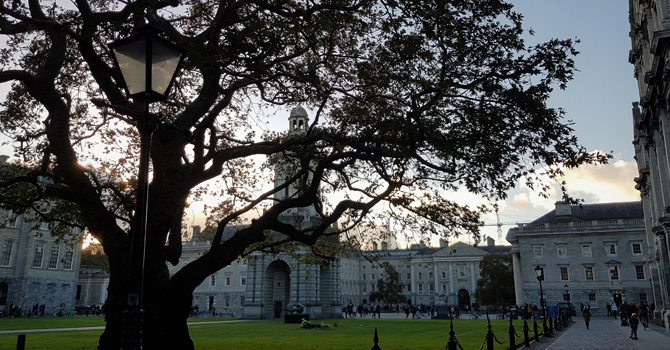 Maybe this article helped you to get a small impression about the Ireland, Trinity College and studying History or maybe my own little story has given you some insight. Hopefully, it will help you to make the right decision for yourself — It might just be the key to your own fairy tale! Gracias por la referencia personal sobre tu estadía en Irlanda.